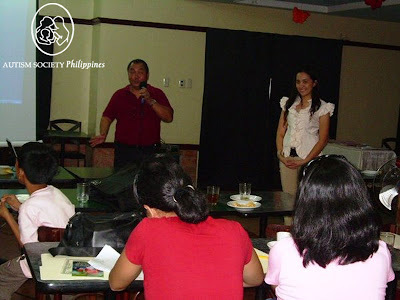 ASP Marikina Valley Chapter President, Alex Cabason and his team are planning their First Family Day Celebrations on April 9, 2010. The chapter, barely 2 years old, thought of having the activity to commemorate the 3rd World Autism Awareness Day Celebrations with potluck, games for children and an informal fellowship with parents. Marivi Cabason, Alex’s supportive wife, sent us an email detailing their chapter accomplishments from August to December 2009. Alex Cabason giving lecture of "The Benefits of a Parents Support Group"
About 150 participants flocked to the Riverbend Hotel to listen to Alex’s lecture on “The Benefits of a Parents Support Group” last August 9, 2009. This was in response to the invitation of Irma Coronel, one of the officers of the Philippine Foundation of the Rehabilitation of the Disabled, Inc. through, Chyril Cariño (ASP Marikina Chapter active member). 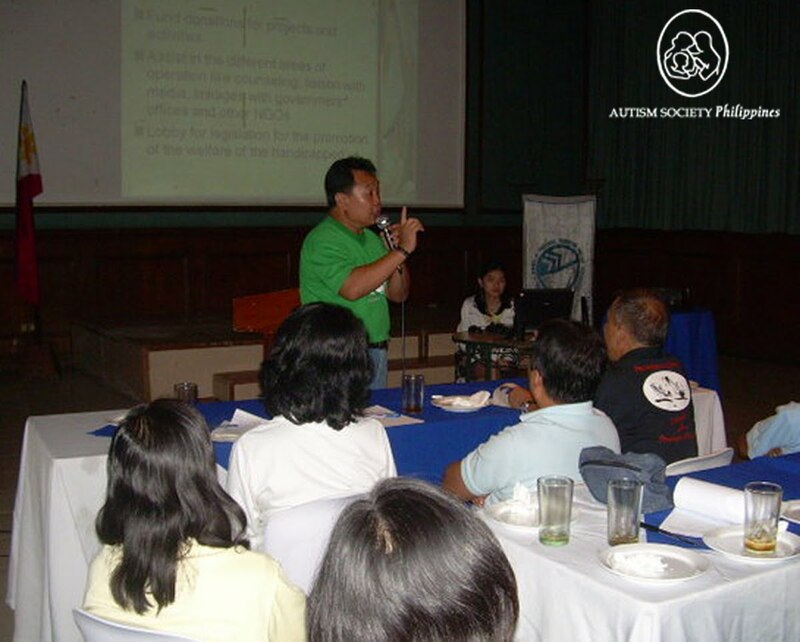 A second talk on “The Importance of a Support Group,” was held at SM South Mall, August 21, 2009. A Family Support Group Meeting was also conducted last Dec 19 in Barangka Elementary School and was attended by 25 parents. Christmas party followed after. 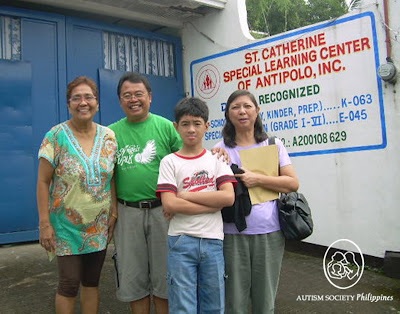 Alex Cabason together with his wife Marivi and son with autism, Vinz, visited the St. Catherine Special Learning Center in Antipolo, owned and administered by Ms. Fe Aquino. The visit sought to establish a linkage with the Pagmamahal sa Kabataang May Kapansanan Foundation in securing financial assistance for ASP Marikina children with autism. Several parents have applied for assistance from the foundation through ASP-Marikina Chapter. The Pagmamahal sa Kabataang May Kapansanan Foundation receives and manages the Financial Subsidy given by Lillian Foundation of Netherlands. The foundation assists indigent families who have children diagnosed with autism, needing therapy (occupational, speech or physical therapies) or special education services; but are unable to afford them. Several parents have applied for assistance from the foundation through ASP-Marikina. A 50% subsidy is shouldered by the foundation and is remitted directly to the center/school/institution that provides the services, while the other 50% is shouldered by the beneficiary family. and (R- Standing) Zhyra Lucas during the "Guided Movie Viewing"
The Chapter also participated in a study on “Guided Movie Viewing.” The study is conducted by, Zhyra Lucas (ASP Marikina Valley member), who is a candidate for Masters in Special Education at University of the Philippines, Diliman as part of her thesis. The study was held in a small restaurant at Brick Road, Sta. Lucia in four sessions (August 8, 15, 22 and 29, 2009). The study aimed to show how watching a good movie can be therapeutic to parents with special children, helping them to be relaxed and to be temporarily free from worries. After each film, Ms. Lucas also had an open discussion with the participants. She solicited viewers’ reactions and insights on how they related to the film and asked them to contribute their own experiences in parenting children with autism. ASP Chapters work hard for the future of children with autism and their families. To request for a Guided Movie Viewing, please contact ASP-Marikina Chapter President Alex Cabason at mobile no. 0939-4668655 or click here to visit their site.Some of the films shown are also available at the ASP Library visit us at Room 307, #47 ML Building Kamias Road, QC. or contact 926-6941/ 9298447 for more details.